Join Joe and learn how to make a pretty seasonal wreath or an unusual table topper! Join Robin to make the Large Retreat Bag from Emmaline Bags (note: pattern free online). They make a perfect gift and are just plain fun to make. Do your fusing and cutting before you come and leave the class with a finished bag! Join Joy and learn to make this fun and modern quilt. Pattern has easy-to-follow instructions for three different sizes. Have fun learning quilting basics including rotary cutting, quilt rulers, quarter inch seams, half square triangles, flying geese, Y seams, templates, applique, bias cut fabric, easy curves and fusible web. 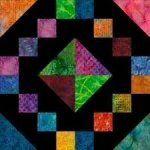 You will learn 14 different quilt blocks. Degree of difficulty increases each week. Snails Trail Al Fresco Class details & supply list given with paid registration. Want the convenience of a quilt retreat while staying home? Join our quilt camp. 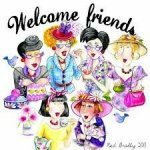 Meet new friends and socialize while getting your quilting done. You can bring your own projects or choose to do one of the 3 projects that we will demonstrate. Barbara & Cheri will help with your ironing, ripping, pinning and any sewing questions. No need to take your machines home at the end of the day, just leave in place and be ready to start again the next day. Lunch provided on Saturday. More information will be provided with paid registration. Sign up in store. Join us for Thursday night sewing. The shop is open until 8. Reservations are required. Please call to reserve your spot. Come Join the Fun and learn how to make your own beautiful Tuffet.